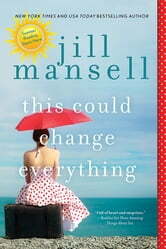 International bestseller Jill Mansell crafts the perfect summertime tale, filled with love, friendship, and the power of redemption. You'll laugh, you'll cry, and you'll never want the story to end. Things go wrong, yet so right. Highly recommend! I loved this tale, from its first chapter introducing an eccentric supporting character to the main character's embarrassing mishap and her personal growth into a more interesting character. This is a romance mixed with farce (somewhat a "comedy of errors") and the many characters, even the obnoxious ones, are well-rounded and well-written.